So… hey… how have you all been? Me? I’ve been better. I’ve been pretty tired these past few weeks, but contrary to that popular belief, I’ve been working hard! I’ve even been pushing hard on my birthday so that you all can get your first taste that will be Rising Angels. Let’s cut to the chase, shall we? 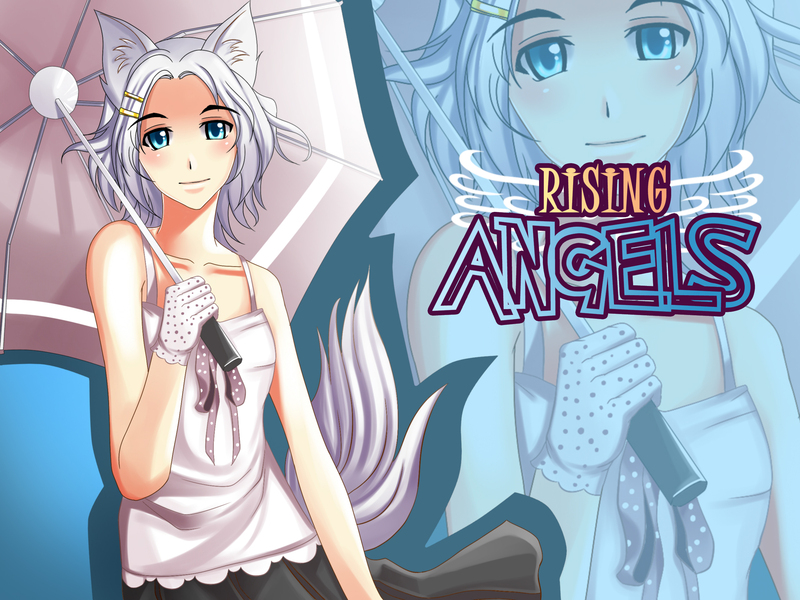 I’m here to give you all the very first alpha demo of Rising Angels. It covers the intro section and the first Act of Lenna. I know that doesn’t sound like a lot, especially since there are numerous missing features, but sometimes I just gotta share what I’ve been doing with my fans! After you play it, I’d love to hear what you think. Your favorite character, least favorite, things you want to see… really, I’d love to hear any of your thoughts. The game contains 3,291 screens of dialogue. for an average of 11.2 words per screen. The game contains 0 menus. WARNING: Game does contain cursing and occasional sexual humor. Note: The save/load button is not programmed yet. Use right click or esc to pull up the save menu. Forgot to include this in the list of things in the readme. Congrats on the release! Looking forward to playing it! After playing through this twice now, here are my thoughts: Favorite character: Faye, although I liked Lenna as well. Overall impression: I liked it, a few typos, but being a first demo, that is to be expected. I can’t wait to see the full release down the road! downloading right now. Could you possibly put torrent download in the future? I’ll keep that in mind for future downloads. Previous games never reached this size, so I’m learning new tricks. Every time I try and Download the Demo it times out. Is there any mirror for this possibly?